Ghouls are undead that haunt graveyards and eat corpses. 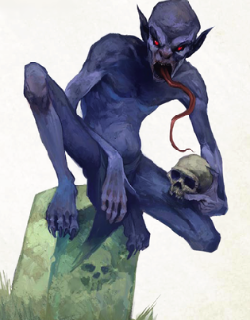 Legends hold that the first ghouls were either cannibalistic humans whose unnatural hunger dragged them back from death or humans who in life fed on the rotting remains of their kin and died (and were reborn) from the foul disease—the true source of these undead scavengers is unclear. Ghouls lurk on the edges of civilization (in or near cemeteries or in city sewers) where they can find ample supplies of their favorite food. Though they prefer rotting bodies and often bury their victims for a while to improve their taste, they eat fresh kills if they are hungry enough. Ghasts are the more powerful cousins of ghouls. Their paralytic venom can even stop an elf in its tracks. Ghasts roam in packs of their own kind or lead groups of common ghouls. The stink of death and corruption surrounding these creatures is overwhelming. Skeletons are the animated bones of the dead, brought to unlife through foul magic. 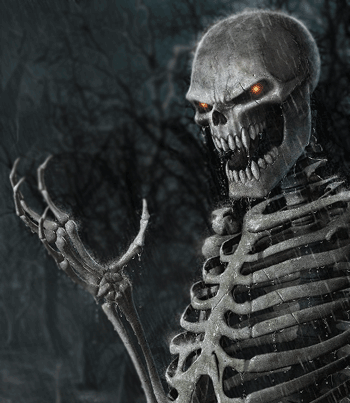 While most skeletons are mindless automatons, they still possess an evil cunning imparted to them by their animating force—a cunning that allows them to wield weapons and wear armor. Their bony forms render them less vulnerable to arrows and stabbing implements, so it is wise for undead hunters to carry a mace or other blunt-force weaponry.